Be sure to buy boneless country style pork ribs. They should be pre-cut into rib sized pieces. Cut each rib segment into 2 or 3 equal sized cubes. Be sure to buy kale with nice large leaves that are firm and not broken. Gather up some of the nicer leaves and cut the stem near where the leaf starts. Toss the meat in a splash of vinegar, and liberally salt and pepper them. 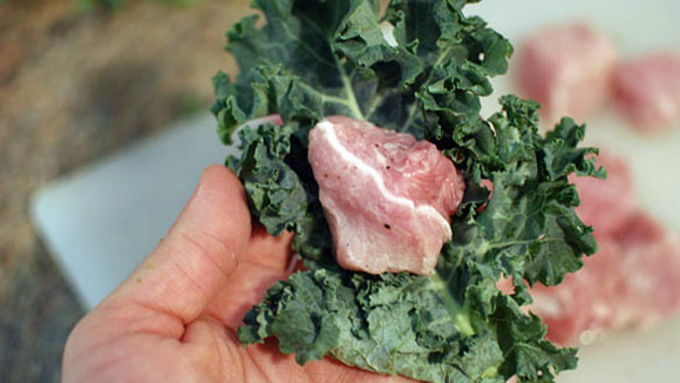 Take one piece of meat and one kale leaf, and roll the leaf around the meat, securing it as best as you can. I poked the stem of the kale through the leafy part to sort of lock it on there. Line the bottom of your steamer with more kale, then place the pork packets in. Don't worry if they aren't perfectly sealed. 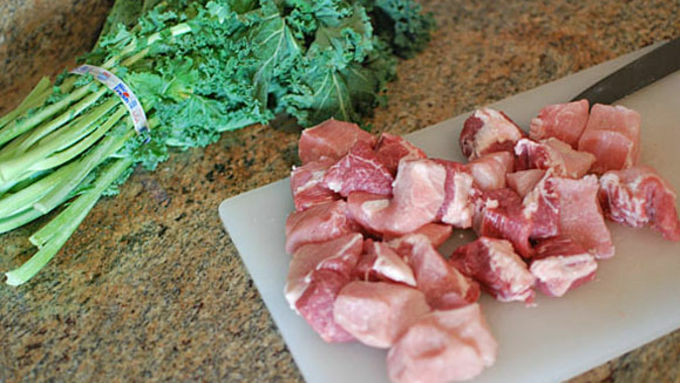 As the kale wilts, it will wrap itself around the pork better. Top with more kale and cover. Steam for about 2 1/2 hours. Remove and serve with rice. Before we start, I just want to get one thing out of the way. This isn’t exactly true LauLau. 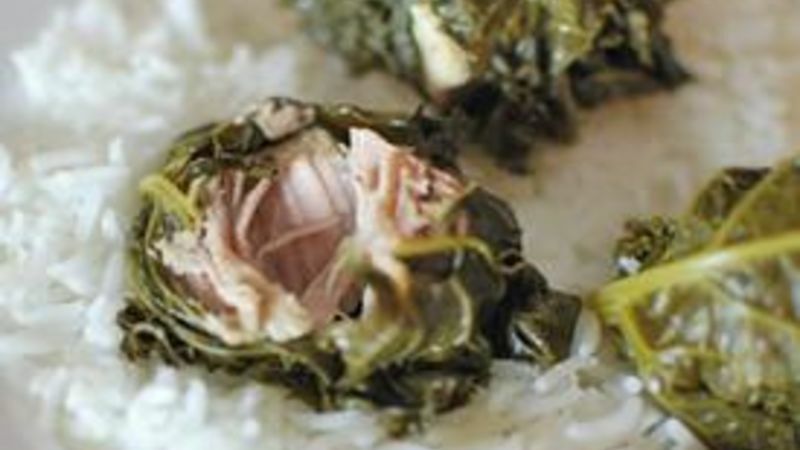 It's a dish inspired by Hawaiian LauLau, and it is delicious, but LauLau it isn’t. I just want to make things clear because some people are enrolled in an organization called “food blog police” whose sworn duty is to surf the interwebs making sure that all recipes comply with official rules about what is and isn't in certain dishes. That's all fine and good; in fact we need people like that out there to keep people like me honest! Phew, I feel better now. That being said, this easy little dinner involves only a few ingredients and is absolutely fantastic. As I was making it, I kept thinking that I should add some seasoning here, an herb there, but no, it didn’t need it at all. 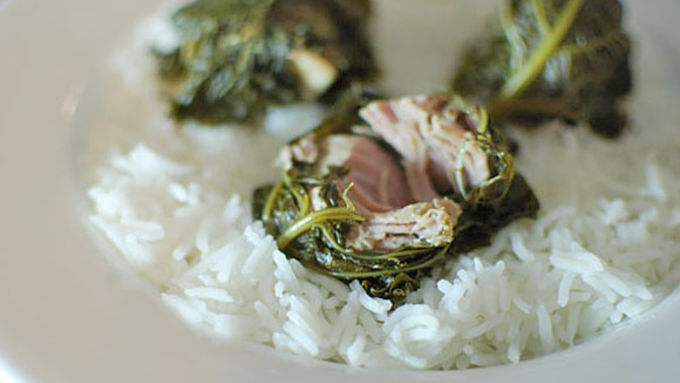 The kale flavored the pork, the pork flavored the kale, and everything tasted simple yet amazing.If you don’t count salt, pepper, and a splash of white vinegar (which I don’t) then this recipe literally consists of two ingredients; pork and kale. 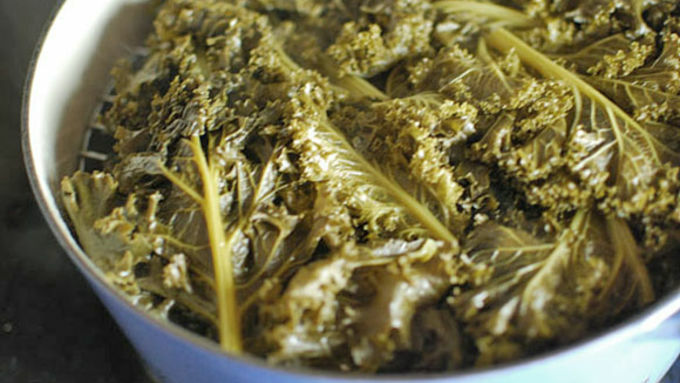 It might seem awkward at first, considering that the kale is all ruffles, but you don't have to be strict about the wrapping, just make sure it’s covered on all sides and call it a day. As the kale wilts in the steamer it will seal itself to the pork better. Serve over rice. Man, this meal was shockingly good! I say shocking just because of the simplicity of it. Steamed shreddy pork really fills the soul on a winter’s evening. Try these Hawaiian treats the next time you want tropical flavor you can make at home.